Les Roches is a hospitality management school with a unique model of education that fosters an entrepreneurial environment. 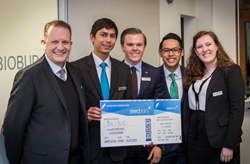 Les Roches Global Hospitality Education organised the second hospitality bootcamp for Les Roches students in partnership with international group Seedstars on 14 and 15 February on the Les Roches campus in Bluche, Switzerland. A total of 93 students from the entrepreneurship specialization of the Bachelor in Hospitality Management teamed up in 23 groups to present their business plan and start-up ideas related to the hospitality world to a jury of Seedstars experts and Les Roches faculty for a chance to participate in the Seedstars Summit on 12 April. The three winning groups were BioBud, an environmentally-conscious online travel agent helping travellers connect with trustworthy eco-friendly providers; before runners-up Cause Café, a coffee shop targeted at students with a strong CSR agenda; and Finesse, an application to virtually try on clothes. During this three-day immersion into world of start-ups, students were coached to better understand the complex world of entrepreneurship. Renowned entrepreneurs such as Max Ruffo, Founder and CEO of Terabee, a sensor technology start-up in Geneva and Julien Pache, COO of Swiss venture capitalist investiere.ch shared their experience and insights on how to build and deliver a pitch to investors. "Les Roches is a hospitality management school with a unique model of education that fosters an entrepreneurial environment. 33% of our graduates go on to create their own business ventures, so entrepreneurship is part of our culture and DNA," said Stuart Jauncey, Managing Director of Les Roches. "Through the Seedstars Launchpad, we hope to further instil the entrepreneurial mind-set in our students and the search of investors as a crucial part of any start-up business." "We are delighted to collaborate with Les Roches to promote and support young entrepreneurs on campus. We are impressed by the school's agility in defining the academic curriculum and course content to provide students with the tools to succeed professionally," said Alisée de Tonnac, co-founder of Seedstars Group. "Let us not forget that we do not yet know what 50% of tomorrow’s jobs will look like. Adaptability and learning by doing are all the more important." This competition follows Les Roches’ commitment to prepare students for the professional requirements of the global hospitality industry, a sector set to create 90 million new jobs by 2027, according to the World Travel & Tourism Council. Founded in 1954, Les Roches Global Hospitality Education is a private institution based on the Swiss model of experiential learning, offering undergraduate and graduate degrees in the fields of hospitality, tourism and event management. Les Roches prepares entrepreneurial and innovative graduates across a global network of campuses in Switzerland, Spain, the US and China. Part of Sommet Education, Les Roches is accredited by the New England Association of Schools and Colleges, Inc. (NEASC) and ranked among the world’s top five higher education institutions for hospitality management (QS World University Rankings 2017). Seedstars is a Swiss based group with the mission to impact people’s lives in emerging markets through technology and entrepreneurship. Seedstars connects stakeholders, builds companies from scratch with public and private partners and invests in high growth startups within these ecosystems. Through different activities, that range from startup scouting to company building and acceleration programs, the team has built the most powerful network of entrepreneurs, investors, incubators, corporations and government officials from 65+ fast growing economies around the globe. Seedstars group includes Seedstars World, a worldwide startup competition, sourcing the top talent in technology and entrepreneurship in emerging markets; Seedstars Growth, a three month virtual acceleration program; Seedspace, a network of coworking and co-living spaces now in 35+ countries and Seedstars Academy, a six months intensive training for aspiring local entrepreneurs on how to build sustainable businesses. Some of Seedstars main partners are Enel (Energy), HEG Fribourg & Trecc (Education), BBVA (Finance), Tag Heuer (Fempreneurship and Innovation) and Merck (Health).